Vipre Internet Security 2013 from GFI is a well known security suite which is packed with bullet proof security features that will protect you against any kind of malware threats or online attacks. Itis main features include a powerful two-way Firewall, Spam filter, Bad website blocker, Email scanning module, privacy cleaner, secure shredder etc. Inspite of having such a number of features Vipre Internet Security 2013 runs smoothly without slowing down your PC even during scans and updates. With its new VIPRE® Easy Install™ feature, unwanted conflicting softwares are removed during a smooth trouble free installation. Thanks to the new VIPRE® Easy Update™ feature, new definition and product updates are installed silently without bugging you. Two-way Firewall of Vipre Internet Security 2013 helps you to decide what programs you want to allow to connect and also protect you from unwanted incoming traffic, thereby defeating hacking attempts. The Spam filter in Vipre Internet Security 2013 filters out unsolicited spam mails from you inbox and also protects you from spam, phishing scams and malicious URLs during web browsing. Vipre Internet Security 2013 has a powerful web filter that will restrict access to malicious webpages. Thanks to the award winning powerful antimalware engine of Vipre Internet Security 2013, your PC will be Free from viruses, spyware, rootkits, bots, Trojansm, Rootkits and all other types of malware. It has a efficient real time module and a automatic removable drive scanner. Vipre Internet Security 2013 can protect any email program using POP3 and SMTP from email viruses. It has a secure file eraser module that helps to delete traces of sensitive files. It has a history cleaner module that assists you in erasing your online browsing records. The PC Explorer module helps in finding out hidden processes, startup entries and allows you to remove those. 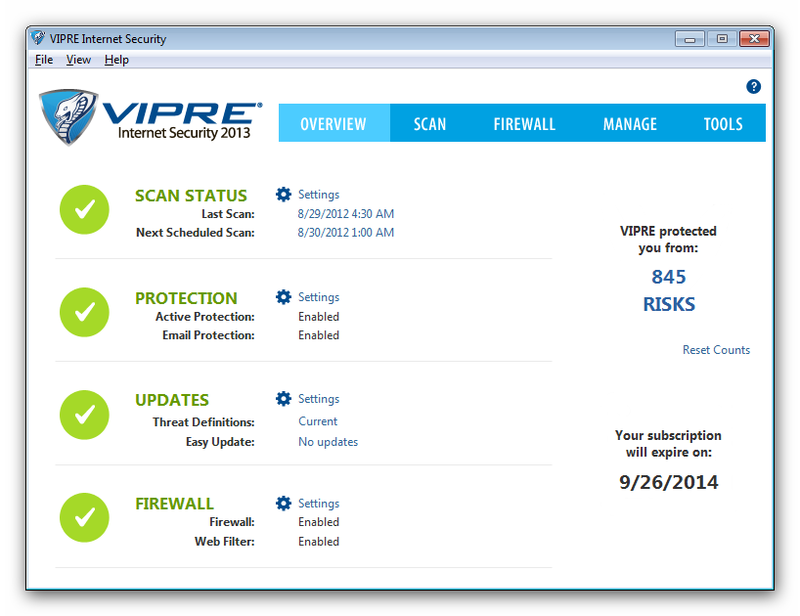 Trial version of Vipre Internet Security 2013 is available in the following Link. 1 Year Vipre Internet Security 2013 for 1 PC costs 49.99 USD, while that for 2-10 PC costs 69.99 USD. Purchase Link. Use This Link to purchase.